Turkey has never been deprived of ironies. Who would think that one day an imam, viewed by secular Turks with deep suspicion, could unite conservative and secular Turks – at least in appearance. After dramatic divisions over the past 14 years it would be too premature to claim that "once again we are united, we are one nation." The optimism is understandable. Over-optimism is not. The new, reasonable political language between President Recep Tayyip Erdoğan and his political nemeses in Turkey is promising. Prime Minister Binali Yıldırım's pledge to never divert from his reconciliatory line (a climate of unity) is promising, too. But the major political fault line that caused past and present political tremors is still there: a secularist urge to "modernize / westernize" conservative Muslims against an even stronger conservative urge to "Islamize" the "white Turks." I am saddened at not having been able to unmask this treacherous organization [Gülenists] a long time ago. For that [failure] I am liable to God and to my nation. May God and our nation forgive us ... We tolerated them [Gülenists] because they spoke of Allah. [We thought] we have something in common [with Gülenists]. We failed to see that this structure [Gülenists] which we viewed as having a common range [goal] through different ways could be one with different intentions and sinister goals. Genuine and honest, yes. But problematic, too. As Selahattin Demirtaş, leader of the pro-Kurdish opposition party, forcefully reminded, why should the Gülenist government and military officials "who, too, failed to see what Gülen [and Gülenists] were about" now face life sentences but the president of the republic should be forgiven by God and by our nation? President Erdoğan's honest confession is also a manifesto providing useful input for any intellectual debate over what political Islam and what its fundamental principle of governance are about. It is a confession that Islamists in governance tend to discriminate against those "who do not speak of Allah." For any favorable treatment in government service, one must either "speak of Allah" or, if he is not so pious, must prove to be a loyal collaborator of the Islamists. The 'common goal' of which Mr. Erdoğan speaks is the advancement of political Islam in Turkey first, then the rest of the world. The "common goal" of which Mr. Erdoğan speaks is the advancement of political Islam in Turkey first and then in the rest of the world. In not-so-encrypted language, Mr. Erdoğan is telling us that that "common goal" was the reason why he failed to unmask the treacherous organization that is Gülen. Mr. Erdoğan's account of "why it happened" is an honest manifesto revealing the usual symptoms of political Islam: The pious-looking are "us" and the rest are the "other." "Us" must always be favored, and the "other" discriminated against – until, of course, an intra-Islamist war divides "us." There is also an unmentioned nuance in President Erdoğan's description of those "who speak of Allah." His political Islam is not so passionately embracing for some other Muslims who, like his stripe, "speak of Allah." In Sunni Islamist practice, a Shiite or an Alevi who "speaks of [the same] Allah" would not grant him entry into the favored group. Mr. Erdoğan's new, softer political language is music to the ears of millions of Turks who are weary of an unnamed (and non-violent) civil war along secular-conservative lines. 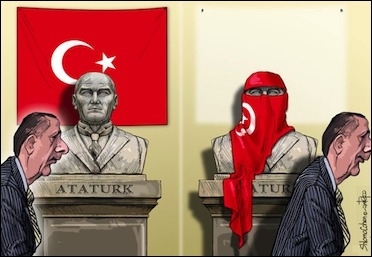 All the same, there is hardly any convincing evidence that the nearly century-long great Turkish divide will disappear just because some crazy officers attempted to take over power and risked a violent civil war that would probably have ended with hundreds of thousands of dead people.